The lines between streetwear and luxury fashion have blurred in recent years, especially as excitement around sneaker brands like Yeezy and Off-White has soared. A marriage between a luxury fashion marketplace and a sneaker and streetwear reseller seems like a natural way to wrap up M&A in 2018. With that said, Farfetch has acquired New York-based Stadium Goods, opting to pay $250 million for the sneaker startup in a combination of cash and Farfetch stock. Headquartered in London, Farfetch went public on the New York Stock Exchange in September, pricing its shares at $20 apiece and raising $885 million in the process. What’s more impressive is Stadium Goods’ journey to exit. The company, which sells new and deadstock products online and in a brick-and-mortar store in New York’s Soho neighborhood, was founded in 2015 by John McPheters and Jed Stiller and had only raised $4.6 million in venture capital funding from Forerunner Ventures, The Chernin Group and Mark Cuban, who is an advisor to the startup. The sale to Farfetch not only provides a major boost to the sneaker tech ecosystem, which is surprisingly much larger than those who aren’t familiar with it might have guessed, but it’s yet another successful e-commerce exit for Kirsten Green, the founding partner of Forerunner Ventures, who’s also backed Dollar Shave Club and Bonobos — direct-to-consumer retailers that sold for $1 billion and $310 million, respectively. Farfetch boarded the sneaker and streetwear hype train a while ago when it incorporated brands like Nike’s Jordan, pairs of which sell for more than $1,000 on the site. The company doubled down on sneakers earlier this year when it began integrating Stadium Goods products. After noticing high-demand, Farfetch founder and CEO José Neves tells TechCrunch, they began acquisition talks with the startup. Stadium Goods will remain independent as part of the deal, with McPheters and Stiller staying on to lead the brand forward. The company’s portfolio of shoes and apparel will be fully available on Farfetch’s e-commerce platform in the coming months. Together, Farfetch and Stadium Goods will focus on international growth. McPheters tells TechCrunch Stadium Goods already had a significant international base of customers, but a partnership with Farfetch gives them the tools to go places they’ve never been. The global athletic footwear industry is expected to be worth $95 billion by 2025. Meanwhile, sneaker resale is a $1 billion market and growing, fueled by a cohort of startups making it easier than ever for sneakerheads to locate rare shoes online and have them delivered to their doorsteps. That includes Stadium Goods, Flight Club, GOAT and StockX. All four of these resellers, which ensure authentication of their products, are backed by VCs. 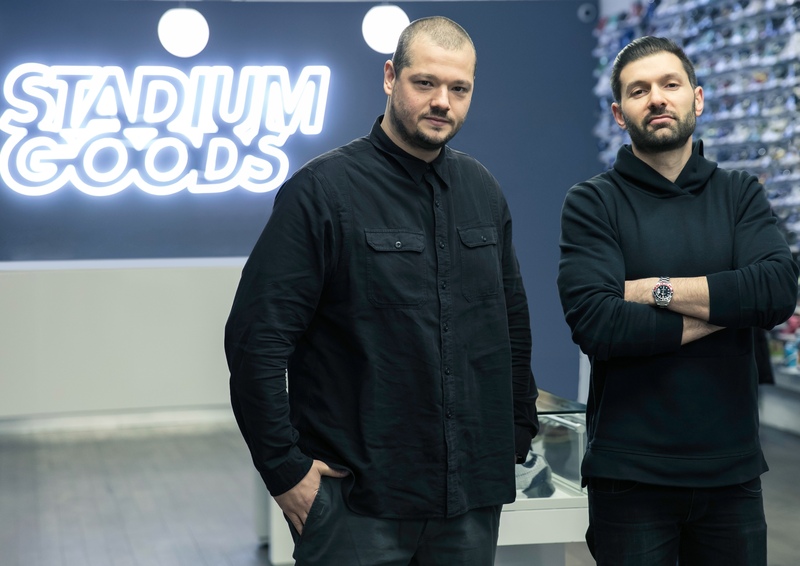 Flight Club merged with GOAT earlier this year and together the pair raised a $60 million Series C. Before that, GOAT had brought in $30 million for its secondary market for collectible shoes from Accel, Upfront Ventures, Matrix Partners and more. StockX, for its part, has raised just over $50 million from Mark Wahlberg, Scooter Braun, Wale, Eminem, SV Angel and others. According to Crunchbase data, VCs have funneled more than $200 million into sneaker startups in the past two years. Now, given the size of Stadium Goods’ exit, investment in the space will likely pick up significantly as other VCs hope to land an exit multiple that substantial. Whether the reselling market will continue to expand is in question. Some have called it a bubble poised to burst, claiming it’s at its “height in popularity.” Why? Because corporate shoe brands like Nike and Adidas are keenly aware of the secondary market for their products and how they, too, can profit from it. If they decide to increase the supply of particular shoe models hot on the secondary market, they can radically disrupt the reseller economy. McPheters, however, says this doesn’t concern him.